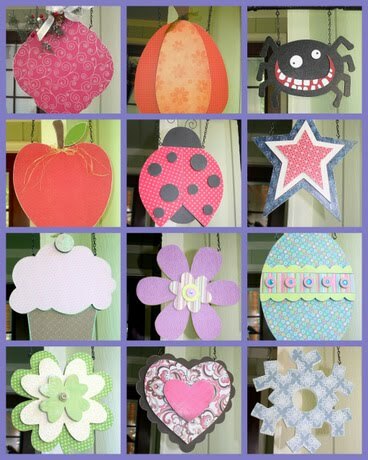 Sweet Pickle Designs: Boo To You! Here's my latest fun projects for Halloween! It's from Echo Park Paper Co.
not wanting the typical ghosts that usually accompany them. The eyeballs are actually eye screwed in for a nice dangle effect! that I was sure pleased with! They almost took up my whole counter! for all the fun things we have up our sleeve! I'll try to post them as soon as they are done! I am so thrilled to find you and I LOVE your projects. Do you ever just sell the wood or the pattern ideas? I'm definitely going to be visiting you a lot! I was wondering the same thing! Can you just buy the wood letters as a DIY? THanks! I really love the font in Beware! I have a scrapbook page that needs it would you be willing to share?? oh my goodness! I just found your blog and these are ADORABLE! What are your favorite fonts to use? I just inherited a scroll saw and since I have been in the vinyl decor industry for a few years now I wanted to change it up a bit and test out my new toy. I LOVE fonts and you are a projection of everything I wanted to do!! wow!